fmorandat on: Why SQLite toolkit for LabVIEW? We are pleased to announce that the last version of our free toolkit ViBox - XControls is now available through VIPM. We are also really proud to have this product part of the gold level products of the LabVIEW Tool Networks. We want to thank you, all users of the toolkit, and we hope it help you to achieve your LabVIEW project. We still love hearing feedback from you to improve the future release. If you want to share example on how you use our toolkit, feel free to use the discussions tab to show us snapshots of your application. We hope that will give you an easier and faster way to use our product. We are pleased to announce you that our free ViBox - XControls is now part of the LabVIEW Tools Network. This product as reached the first level of Compatible with LabVIEW certification that guarantee you a well-integrated with LabVIEW product. You can now download our product through VIPM and use it in any LabVIEW application you want. If you have any problem using this product, you could find support here. Also, feel free to share any good experience you could have and discuss about how to improve this toolkit at the same location. We have recently come across a bug in our custom probes toolkit. This bug could, in really specific case, crash LabVIEW. We fixed this issue and encourage all users to upgrade the toolkit as soon as possible to avoid any inconvenience. We've also added probes to visualize Boolean array in a re-sizable way and adressed another minor bug. Note : We expect that the package would be available soon through VI Package Manager. For those who don't want to wait, download and install the package in attachment. If your are following this blog, you know that at SAPHIR, in addition to our main activity of developing specific applications for our customers, we develop some useful toolkits. You also have to know that we have design a great app to adress one of the major problem of engineers : find information in data provided by applications they use. As a side note, developpement done for Topaze will soon allow us to give you a free toolkit of XControls. We hope that, Topaze and this toolkit, will be useful for you. 5 Clever Debugging Techniques for Every NI LabVIEW Developer. Few months later Omar Mussa and Justin Goeres have wrote and article based on this presentation on the NI Developer Zone and finaly this article has been published in the 1Q2012 of th Instrumentation Newsletter. We want to thank you them for all their work toward the developer community and also to promote our toolkit. We hope that it could help every LabVIEW developer daily. Note that we listen every feature and improvment requests concerning our Custom probe toolkit from user here. As we already have released our custom probes toolkit, we are about to release a second free toolkit. This one is focused on XControls we have developed for internal needs. More than a large text description, I would suggest you to watch these demo videos about two of the XControls that will be available for free in our toolkit. We hope to release this toolkit in a couple of weeks, so stay wired to our community group. Regarding the rules of brand names, we are brought to change the name of our product, initially named "MySQLVIEW", dedicated to the communication between the LabVIEW™ and LabVIEW Real-Time™ environments and a MySQL™ database "The world's most popular open source database" by the Oracle Corporation. We would like to appologize to the Oracle corporation, and thank them for pointing out this error to us, as well as their understanding and tolerance. We also like to appologise to our clients for the inconvenience, and hope that it clarified the purpose of our software. En respect des règles d’utilisation des marques, nous sommes amenés à réviser le nom de notre produit initialement appelé « MySQLVIEW », dédié à la communication depuis les environnements LabVIEW™ et LabVIEW Real-Time™, avec une base de données MySQL™ « The world's most popular open source database », de Oracle Corporation. Nous prions la Société Oracle Corporation de nous excuser de l’abus temporairement commis et nous la remercions pour les indications qui nous ont été fournies et pour sa tolérance. Nous prions nos clients de nous excuser pour les désagréments induits par le changement et nous espérons à cette occasion clarifier le champ d’action des logiciels proposés. 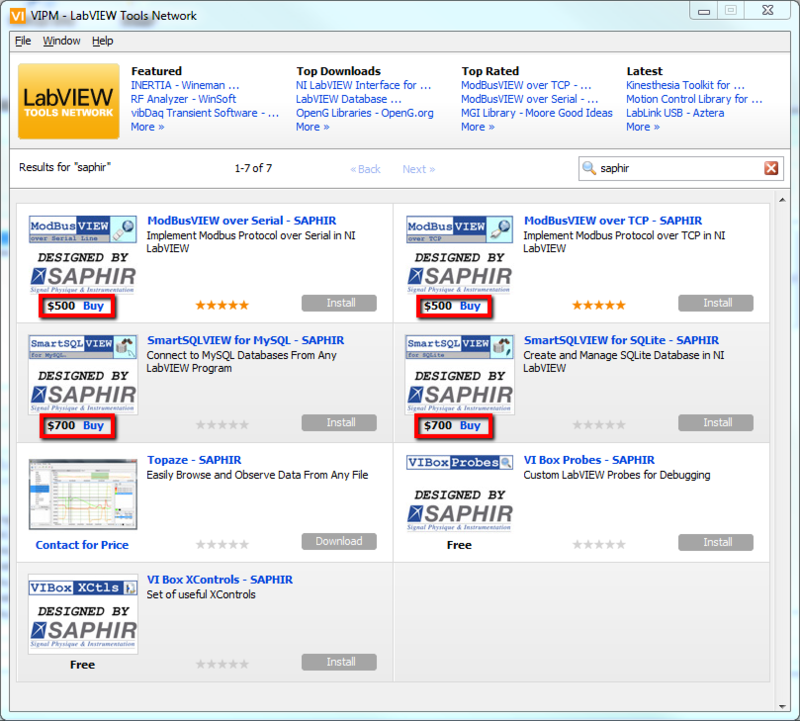 SAPHIR has been recognized as "a valued Alliance Partner committed to project excellence and customer success"
ModBusVIEW over TCP has been recognized as "a silver Product in the compatible with LabVIEW Program"
Be sure that this encourage us to deliver you the best products in the coming years. ModBusVIEW over TCP available now ! You can install and evaluate (30 days) our new toolkit using VIPM 2010 from JKI. Download VIPM 2010 community edition for free. Just install toolkit and go to SAPHIR's function palette to find ModBusVIEWoTCP. 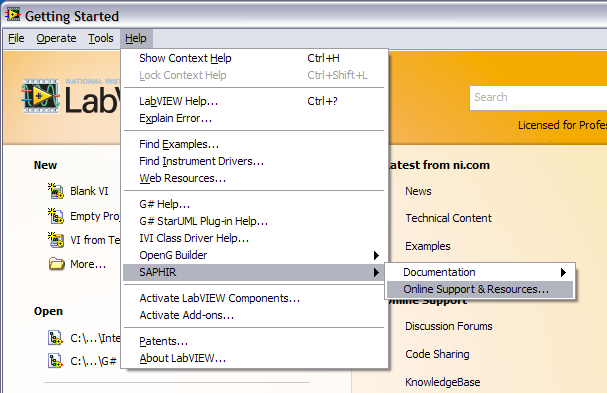 You can also find examples in NI Example Finder (Help >> Find Examples... in NI LabVIEW menu) and useful tools (Tools >> SAPHIR >> ModBusVIEW over TCP in NI LabVIEW menu). Just go on our shopping cart, purchasse ModBusVIEWoTCP and you'll receive activation code. In NI LabVIEW 2010 menu, just go to Help >> Activate Add-ons... and follow displayed instructions. Nous sommes heureux d'annoncer la disponibilité de ModBusVIEW over TCP sur le LabVIEW Tools Network. 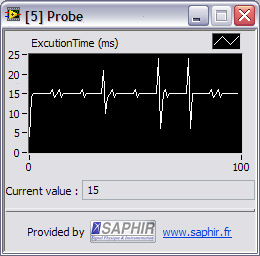 Ce toolkit est un produit Compatible With LabVIEW Argent. Vous pouvez installer et évaluer durant 30 jours notre toolkit en utilisant la version gratuite de VIPM 2010. Installez notre toolkit et vous trouverez la palette ModBusVIEWoTCP dans la catégorie SAPHIR. 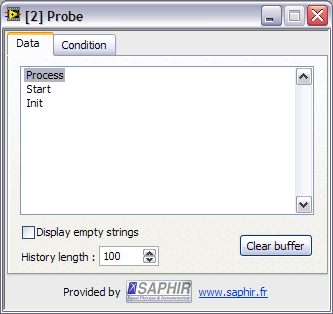 Vous trouverez également des exemples dans NI Example Finder (Help >> Find Examples... dans le menu de LabVIEW) des outils utiles pour vos développements (Tools >> SAPHIR >> ModBusVIEW over TCP in NI LabVIEW menu). Connectez-vous à notre magasin en ligne, achetez ModBusVIEWoTCP et vous recevrez automatiquement votre code d'activation. Dans le menu de LabVIEW 2010, sélectionnez Help >> Activate Add-ons... suivez les instructions affichées. Our SQLiteVIEW toolkit had been upgraded last week to add an easy way to go to our support page directly from LabVIEW via Help menu. This update, in version 1.0.1.39, is free and is available through VIPM. In an other hand we have released an additional package to SQLiteVIEW. It allows you to write (and read) cluster formatted data directly in an sqlite database. More info are available here. At SAPHIR we are used to put some helpful tools in our "VI Box". These tools help us every day in our LabVIEW developments. Today, we want to share (free of charge) our custom probes with you. This is not revolutionary, we just hope that it'll help you to find and fix bugs in your code. Installed probes are located in the wire contextual menu "Custom probes". 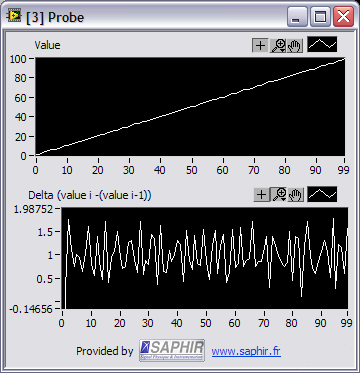 Probes are also available on numeric array, on boolean (scalar and arrays). Probes containing graphs are resizable and provide you access to zoom tools and plots properties. 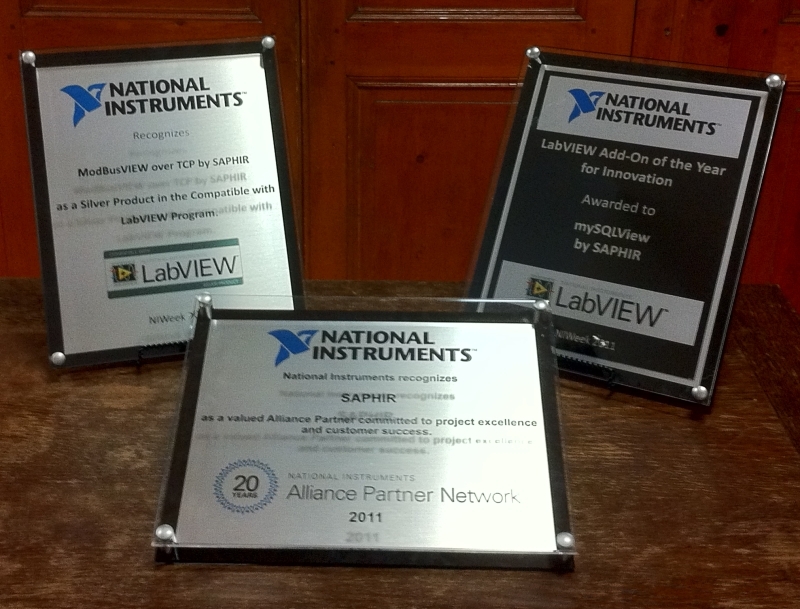 We are pleased to announce that SQLiteVIEW is certified by National Instruments as Compatible With LabVIEW. Our developers work to give you the best user experience with our toolkit in LabVIEW. We are happy to announce SQLiteVIEW availability on the NI LabVIEW Tools Network repository ! In a couple of week, SQLiteVIEW will be added to the LabVIEW Tools Network, the "New App Store for Engineers and Scientists". Just go on our shopping cart, purchasse SQLiteVIEW and you'll receive activation code. For this first release, we are offering a special discount of 300$ up to the end of the year. To benefit of this offer, just enter RELEASE in priority code field in your shopping cart. Why SQLite toolkit for LabVIEW? Using a database is more and more requested to manage information in your LabVIEW application. Unfortunately, most of client-server solutions are complex to configure and maintain. SQLite is certainly the right solution ! SQLite is a zero-configuration database. SQLite does not need to be "installed" before using it. There is no "setup" procedure. There is no server to be started, stopped, nor configured. There is no need (with administrator privileges) to create a new database instance or assign permissions to users. SQLite uses no configuration file. Nothing needs to be done to tell the system that SQLite is running. No action is required to recover data access after system crash or power failure. There is nothing to troubleshoot. Other database engines may run great once you get them going. But doing the initial installation and configuration can often be intimidating. The SQLite database file format is also stable. All releases of of SQLite version 3 can read and write database files created by the very first SQLite 3 release (version 3.0.0) going back to 2004-06-18. This is "backwards compatibility". The developers promise to maintain backwards compatibility of the database file format for all future releases of SQLite 3. "Forwards compatibility" means that older releases of SQLite can also read and write databases created by newer releases. SQLite is usually, but not completely forwards compatible. The stability of the SQLite database file format and the fact that the file format is cross-platform combine to make SQLite database files an excellent choice as an Application File Format. Adobe uses SQLite as the application file format for their Photoshop Lightroom product. SQLite is also a standard part of the Adobe Integrated Runtime (AIR). It is reported that Acrobat Reader also uses SQLite. Apple uses SQLite for many functions within Mac OS-X, including Apple Mail, Safari, and in Aperture. Apple uses SQLite in the iPhone and in the iPod touch and in iTunes software. The increasingly popular Dropbox file archiving and synchronization service is reported to use SQLite as the primary data store on the client side. SQLite is the primary meta-data storage format for the Firefox Web Browser and the Thunderbird Email Readerfrom Mozilla. We believe that General Electric uses SQLite in some product or another because they twice wrote to the SQLite developers requesting the US Export Control Number for SQLite. So presumably GE is using SQLite in something that they are exporting. But nobody (outside of GE) seems to know what that might be. It is known that Google uses SQLite in their Desktop for Mac, in Google Gears, in the Android cell-phone operating system, and in the Chrome Web Browser. People are suspicious that Google uses SQLite for lots of other things that we do not know about yet. Engineers at Google have made extensive contributions to the full-text search subsystem within SQLite. McAfee uses SQLite in its antivirus programs. Mentioned here. It can inferred from traffic on the SQLite mailing list that at least one group within Microsoft is using SQLite in the development of a game program. No word yet if this game has actually been released or if they are still using SQLite. The popular PHP programming language comes with both SQLite2 and SQLite3 built in. SQLite comes bundled with the Python programming language since Python 2.5. The REALbasic programming environment comes bundled with an enhanced version of SQLite that supports AES encryption. There are multiple sightings of SQLite in the Skype client for Mac OS X and Windows. Solaris 10 uses SQLite as the storage format for its Service Management Facility. Thus, Sun has essentially replaced the traditional unix /etc/inittab file with an SQLite database. SQLite is an integral part of Symbian's operating system commonly found on high-end cellphones. A representative of Toshiba wrote to the SQLite developers and requested the US Export Control Number for SQLite. We infer from this that Toshiba is exporting something from the US that uses SQLite, but we do not know what that something is. Why not using SQlite in your own LabVIEW application !